Having seen how our control component can be controlled by a supervisor, now let us make the supervisor control more advanced. We want to emulate a temperature control system, where the set point (ie the desired temperature) changes during the day - with colder temperatures at night and warmer temperatures in the morning and afternoon. We will use a timer in the supervisor to determine when to send set points to the servant (via required changed). The timer subcomponent that we also used in tutorial (step 4 and 7) contain many different methods that can be used to implement different timings. Open the subcomponent PD 4404 Timer_subcomponent and read the explanations about the different methods. Pay special attention to the method "Run_timermethod_at_time_of_day" as this is the one we will use for our temperature control system. Note that all time in VIGO6 is expressed in UTC (coordinated universal time). The method "Run_timermethod_at_time_of_day" makes sure that the timermethod runs every day at a specific amount of seconds after midnight. We want our method to run at 06.30 Danish summertime, which is UTC+2. Hence the time in UTC is 04.30. This corresponds to 4,5 hours*60 minutes/hour*60 seconds/minute = 16200 seconds. Step 2. Creating an array of time and set point pairs. We need to build a structure that can hold 4 instances of time/set point pairs. First we build a record containing two fields: time and set point, and then we will create an array of this record type. Create a new record - rename to "temperature_control_data_rec". Add a record field of type "float 32", rename to "set point and set quantity type to "Absolute temperature". Add another record field of type "float32", rename to time and set quantity type to "TimeOfDay". Create a new array of type "array". We wil learn about explandable arrays, adaptable arrays and subcomponent arrays later. Rename the array to "temperature_control_data_array". Right click and set element type to "temperature_control_data_rec". Set "no of elements" to 4. Click on the set_point record and set maximum limit to 100 degrees celcius and minimum to 0 degrees celcius. We now have an array containing 4 records that we can use in our temperature control system. Now let us create a visualisation of the array. This is done by first creating a visualisation of the record. Open your record type "temperature_control_data_rec". Right click and select "Create new view for this type based on" - "PD 3171 record view". Add views for value (PD 12097) and unit (PD2158) for both time and set point. Now open your array type "temperature_control_data_array". Right click and select "Create new view for this type based on" - "PD 6185 Dataarray_view". In the view list, add one instance of the view for your record. NB! You cannot use the graphical editor to view your visualisation of the array. This is because the array gets calculated by methods that are only available at run-time. Now we need to add an instance of the array to our component. Open the component "XX_temperature_controller_simple". 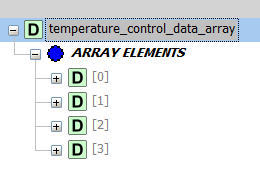 In the non-volatile variables section add one instance of type "temperature_control_data_array", rename to control data. Fill in the array with the default values for the regulation times and corresponding set points.